"I'd like the business cooler and the weather warmer." 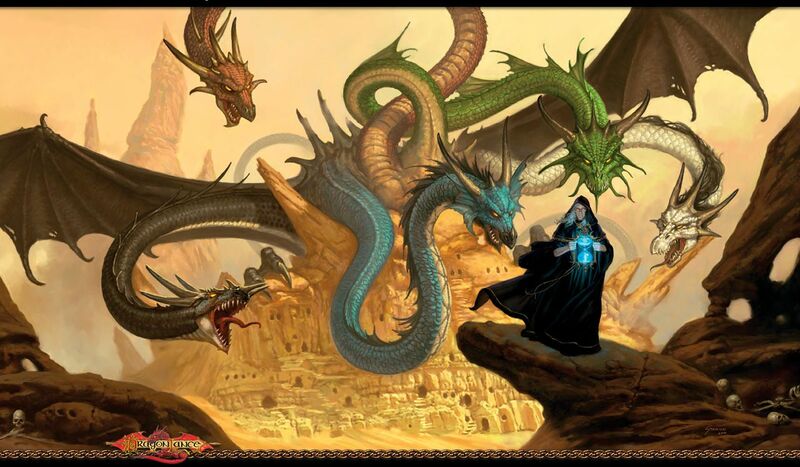 What's your favourite Dragonlance Quote? (to Tanis) Why the beard? You were ugly enough. First the kender get us charged with inciting a riot, than he disappears. Now the knight get us thrown into prison. Next time, remind me to stick to the mage. I know he's crazed! Of all the hatreds, the ones between families are the cruelest. Do not be ashamed, Tas. Be thankful you can feel pity and horror at the death of an enemy. The day we cease to care—even for our enemies—is the day we have lost this battle. Magic will be my sword. What magic exists that could be powerful enough to banish the knowledge from my heart that I had once been loved. Not even death can do so much. Bupu, you have been a good and true friend to me. You saved my life and the lives of those I care about. Now you will do one last thing for me, little one. Go back. I must travel roads that will be dark and dangerous before the end of my long journey. I can not ask you to go with me. If we stop living because we fear death, then we have already died. Some of us are not destined to meet again in this world! I will let nothing stop me. Look at Caramon's face, Tanis. He knows! I killed him once. I can do it again. I will do this. Nothing in my life matters except this. No moment in my life exists except this moment. I am born in this moment, and if I fail, I will die in this moment. I wanted to tell her that sometimes, in my long sleep, I dreamt of her. I have sinned enough against the world. Teaching magic to a kender would ensure my damnation. Learn to control the power. Never let it control you! Death is life's one great certainty. Bow only in reverence, never in slavery. So dark. Endless darkness, eternal. It was not the absence of light that was so frightening as the absence of thought, of knowledge, of comprehension. Our lives, the lives of the living will go on. The sun shines, the moons rise, we will laugh and talk, and he will know nothing, feel nothing. Nothing. So final. It will come to us all. It will come to me. Raistlin: This alters time. Astinus: This alters nothing...Time flows on, undisturbed. Raistlin: And carries me with it? Astinus: Unless you have the power to change the course of rivers by tossing in a pebble. Raistlin: Watch, Astinus. Watch for the pebble! Just because a mage wears the Black Robes does not make him evil. Weep as I wept once, long, long ago. Then you will realize, as I did, that it does no good. No one hears you, sobbing in the night alone. I sacrificed myself for myself! Someday, fat innkeepers will bow to me. In a world of the faithless, you are the only one who is faithful. And, because of that, you will be reviled, ridiculed, persecuted. But I see one who loves you, who will risk all to defend you. In my sight, it is always winter, always night. Hope lives. No matter the mistakes we make, no matter our blunders and misunderstandings, no matter the grief and sorrow and loss, no matter how deep the darkness, hope lives. To the Abyss with the Measure! Where has the Measure gotten us? Divided, jealous, crazed! Even our own people prefer to treat with the armies of our enemies! The Measure has failed! The Forestmaster said to us, in Darken wood, that we should not mourn those who have fulfilled their destiny. Mine is fulfilled. We will close our eyes and begin to dream our eternal dream. It’s the sensible, logical thing to do, of course, which is why we don’t do it. The darkness might conquer, but it could never extinguish hope, and though one candle, or many, may flicker and die, new candles would be lit from the old. Thus hopes flame always burns, lighting the darkness until the coming of day. Don't judge Raistlin, Laurana. Things aren't always black and white, as you elves are inclined to believe. The mage has saved our lives more than once. I have come to rely upon his thinking- which, I admit, I find easier to rely on than blind faith! We'll have to go out through the kitchen. Sometimes it hurts to care, doesn't it, Caramon? But it's better than being empty inside. We kender may not be the smartest folk. But we know that we should be fighting dragons, not each other. It's the small things that make the difference. Raistlin! You have on black robes! How wonderful! Can I touch them? Oh, all right. You needn't glare at me like that. It's just that they look so soft. Say, does this mean you're truly bad now? Can you do something evil for me, so I can watch? I know! I saw a wizard summon a demon once. Could you do that? Just a small demon? You could send him right back. No? Well...it's a problem that will be solved by wiser heads than mine. I'm along for the fun. We raise our children to leave us. Raistlin made a mistake- a terrible, tragic mistake. And he did what few of us can do- he had courage enough to admit it and try to do what he could to rectify it, even though it meant sacrificing himself. I am a knight of Solamnia. I am the hand of Paladine, of Kiri-Jolith and of Habbakuk on this world. You are on Krynn. You are mine, Queen of Darkness. I'd like the business cooler and the weather warmer. If I have done nothing else of value in this life, I have loved and been loved. And that is all that truly matters. Did you give Tanin a sword, then bid him break it? Did you give Sturm a shield and tell him to hide behind it? Oh, I know! That is different. That is something you understand. You've never understood me, have you, Father? Yet without the darkness, we would never be aware that the stars exist. Steel: How many spells do you have? Palin: One, but it's a good one. Arrest the tree! Obstructing sunlight! Thats the charge! Good? Triumph? Not so, Half-Elven. The balance is restored. The evil dragons will not be banished. They remain here, as do the good dragons. Once again the pendulum swings freely. No, really? I was feeling a bit under the weather this morning, but I had no idea it was as bad as all that. So I'm dead. Done for. Bought the farm. Kicked the bucket. Was it a nice funeral? Did lots of people come? Was there a twenty-one gun salute? I've always wanted a twenty-one gun salute. Now what was that spell again? Kender are the true innocents of this world. They remind us that we spend a great deal of time and energy worrying about things that are not very important. Most of us walk in the light and the shadow, Tasslehoff, but there are the chosen few who walk this world, carrying their own light to brighten both day and night. Is it eradicating evil? Or are we like children, left alone in the house at night, who light candle after candle to keep away the darkness. We don’t see that the darkness has a purpose – though we may not understand it – and so, in our terror, we end up burning down the house! I am what I have made myself. In a world where most are ignorant peasants, I have made myself a warrior. I take what I can and give when I like. I don't need you, dragon. I don't need anyone! Come on, you insignificant firefly! I have seen bigger sparks from steel and stone! If you think I would demean myself by sleeping with a man to get information, you're wrong, my friend. Fear can turn you inside out or you can make fear work for you. Use it like another weapon. Fear is a funny thing. It can make you weak-kneed, make you pee your pants, make you whimper like a baby. Or fear can make you run faster, hit harder. We will sing the hero songs ourselves. The Solamnics fought valiantly, they held their ground. They did not run, nor did they dishonor themselves by surrendering. I have souls enough, Ariakan. It's the living I want. Tanis: What the- Tanis gripped the top of the wall to steady himself. Dalamar! Where did-? Dalamar: Palanthas. I traveled the roads of magic and do not have time to listen to you spluttering. Are you in charge here? Tanis: Me? Good heavens, no! I'm only- Dalamar: Then take me to someone who is, Dalamar said impatiently. And tell these fools to sheathe their swords before I turn them into pools of molten metal. Don’t look downcast. You will have a chance to die. You are being sent on another task. I have no desire for a device that would carry me backward in time. Unless...unless it would take me back to undo what I did. Perhaps then I might make use of it. But what would be the use? If I had it to do over again, the outcome would be the same. I would make the same decisions, commit the same heinous acts. For that was the man I was. Don’t change color to match the walls. Look like you belong and the walls will change color to match you. As the old gods lost their power, we called to the blank sky into the cold, dividing gray to the ears of the new gods. The sky is calm, silent, unmoving. We have yet to hear their answer. But if you who can see look too long in the sun, you will lose your sight, just as those who live too long in the darkness will gradually lose theirs. This Elistan taught - that mortals were not meant to live solely in sun or in shadow, but in both. In his heart Sturm was a knight. He had better claim to that false title than many who held it for truth. Sturm Brightblade obeyed laws that no one enforced. He lived by a noble code in which no one else believed. He swore an oath that no one heard. Only himself... and his god. No one would have held him to that oath, to the measure. He did that himself. He knew himself. "I wanted to tell her that sometimes, in my long sleep, I dreamt of her." "In his heart Sturm was a knight. He had better claim to that false title than many who held it for truth. Sturm Brightblade obeyed laws that no one enforced. He lived by a noble code in which no one else believed. He swore an oath that no one heard. Only himself... and his god. No one would have held him to that oath, to the measure. He did that himself. He knew himself." "We will sing the hero songs ourselves." "Do not be ashamed, Tas. Be thankful you can feel pity and horror at the death of an enemy. The day we cease to care—even for our enemies—is the day we have lost this battle."